This paper is part of the series Holocaust Handbooks. Click below for the previous or next item of the series. Click on 'up' to return to the series' Table of Contents. Did you know that the mass media were reporting an impending holocaust of six million Jews since the late eighteen-hundreds? Did you know that the media have repeatedly exposed the stories of Holocaust survivors to be lies? 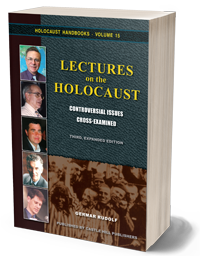 Did you know that many mainstream scholars have expressed doubts about the accuracy of Holocaust history books? Did you know that historians critically investigating the Holocaust narrative are thrown into jail in most European countries, and are not allowed to defend themselves in court? The present book addresses these and many more such issues. In the first section, it starts by defining what “the Holocaust” is and why it is an important topic. It then gives examples demonstrating that it is well to keep an open, critical mind. 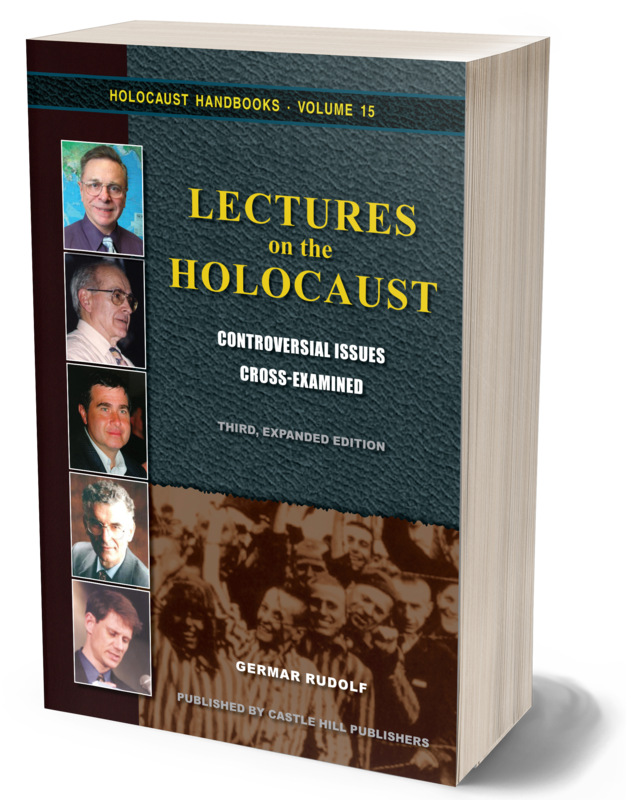 The second section tells the tale of many a mainstream scholar expressing doubts and subsequently falling from grace due to this “heresy.” The third section discusses in detail the physical traces and documents about the various claimed crime scenes, such as the camps at Auschwitz, Treblinka, Belzec and Sobibor. It investigates the claimed murder weapons: gas chambers, gas vans, crematoria and cremation pits. The fourth section thoroughly examines to what degree we can rely on witness testimony, and it analyzes the pertinent aspects of the most prominent among them. In the last section, the author lobbies for free inquiry and a free exchange of ideas about this topic, exactly because the powers that be can’t face critical questions. Of all the thousands of books on this topic, this one gives the most-comprehensive and up-to-date overview of the critical research into the Holocaust. With its dialog style, it is pleasant to read, and with its logical organization and index, it can even be used as an encyclopedic compendium. 3rd, revised and expanded edition, 596 pages. Format: pb, 6"×9", 262 illustrations, bibliography, index. In case you decide to download a free PDF file of this book instead of purchasing a printed copy, please consider supporting the author for his efforts and for the injustices he has suffered (he was sentenced to 30 months imprisonment and a fine of €21,000 (some $28,000) for the 2005 German edition of this book) by making a donation. Details can be found on his website. Note: Books published by Castle Hill Publishers should be available anywhere books are sold – except for those companies boycotting us, like Amazon and Barnes & Noble. Search other online stores using the book-price search-engine links provided below, or when searching other stores use the ISBN number provided above. Also ask your local bookstore to order it for you. They should be able to get it for you. First posted on CODOH: June 4, 2012, 7 p.m.